Egypt's Valley of the Kings is a desolate place. Located near the Nile River across from the ancient city of Thebes (the modern Luxor), the arid valley supports no vegetation and provides no shelter from the relentless sun. The ground is a mixture of sand and small rocks that broil in the sun's heat. Temperatures average 90 degrees Fahrenheit during winter, in summer they soar into the 120s. This is the place the Egyptian pharaohs of over 3000 years ago chose to be interred in tombs buried beneath the lifeless landscape. Surrounded in death by treasures of unimaginable value, the pharaohs hoped to elude discovery by grave robbers that had violated the burial vaults of their predecessors. Their efforts were unsuccessful; thieves pillaged all of the buried tombs in the valley - except one, that of Tutankhamen who died around 1346 B.C. 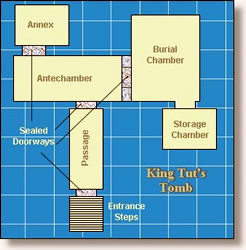 There is evidence that intruders did locate and enter the tomb shortly after King Tut's death, however, they were discovered before much damage was done. The priests guarding the valley reburied Tut's tomb and it remained undisturbed, its location unknown for more than 3000 years. Encased in a coffin of pure gold, the Egyptian King lay in the blackest darkness, surrounded by unfathomable silence. He was immersed in a small slice of the royal world of the pharaohs: golden chariots, statues of gold and ebony, a fleet of miniature ships to accommodate his trip to the netherworld, his throne of gold, toys from his youth, bottles of perfume, precious jewelry, and more. Every corner, every niche of this time capsule from ancient Egypt was filled with priceless objects. Howard Carter, an English Egyptologist, had a hunch that Tutankhamen lay beneath the Valley of the Kings even though conventional archeological wisdom declared that all the area's tombs had been found. In 1914, supported by his British benefactor Lord Carnarvon, Carter began his search in earnest. For seven years his efforts bore no fruit. In November 1922, during the last season of exploration that Lord Carnarvon said he could support, Carter's luck changed. His Egyptian laborers uncovered a series of steps leading down to a sealed door. "Slowly, desperately slowly it seemed to us as we watched, the remains of passage debris that encumbered the lower part of the doorway were removed, until at last we had the whole door clear before us. The decisive moment had arrived. With trembling hands I made a tiny breach in the upper left hand corner. Darkness and blank space, as far as an iron testing-rod could reach, showed that whatever lay beyond was empty, and not filled like the passage we had just cleared. Candle tests were applied as a precaution against possible foul gases, and then, widening the hole a little, I inserted the candle and peered in, Lord Carnarvon, Lady Evelyn [Lord Carnarvon's daughter] and Callender [an assistant] standing anxiously beside me to hear the verdict. At first I could see nothing, the hot air escaping from the chamber causing the candle flame to flicker, but presently, as my eyes grew accustomed to the light, details of the room within emerged slowly from the mist, strange animals, statues, and gold - everywhere the glint of gold. For the moment - an eternity it must have seemed to the others standing by - I was struck dumb with amazement, and when Lord Carnarvon, unable to stand the suspense any longer, inquired anxiously, 'Can you see anything?' it was all I could do to get out the words, 'Yes, wonderful things.' Then widening the hole a little further, so that we both could see, we inserted an electric torch." It was, beyond any question, the sepulchral chamber in which we stood, for there, towering above us, was one of the great gilt shrines beneath which kings were laid. So enormous was this structure (17 feet by 11 feet, and 9 feet high, we found afterwards) that it filled within a little the entire area of the chamber, a space of some two feet only separating it from the walls on all four sides, while its roof, with cornice top and torus moulding, reached almost to the ceiling. From top to bottom it was overlaid with gold, and upon its sides there were inlaid panels of brilliant blue faience, in which were represented, repeated over and over, the magic symbols which would ensure its strength and safety. Around the shrine, resting upon the ground, there were a number of funerary emblems, and, at the north end, the seven magic oars the king would need to ferry himself across the waters of the underworld. The walls of the chamber, unlike those of the Antechamber, were decorated with brightly painted scenes and inscriptions, brilliant in their colours, but evidently somewhat hastily executed. " Carter, Howard, The Tomb of Tutankhamen (1923); Hoving, Thomas, Tutankhamun - The Untold Story (1978). "Entering King Tut's Tomb, 1922," EyeWitness to History www.eyewitnesstohistory.com (2000). Tutankhamen was 9 years old when he became Pharaoh. He died when he was around 18. Lord Carnarvon died 7 weeks after entering the burial chamber giving rise to the theory of the "Curse" of King Tut. 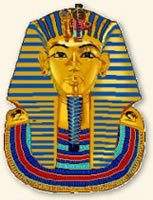 Work at King Tut's tomb continued until 1933.